The German discount chain nearly doubled its advertising spend on the way to record turnover. Inside Aldi's marquee at this year's National Ploughing Championships. BUDGET GROCERY CHAIN Aldi has reported soaring sales amid an advertising binge from all the major Irish supermarkets. The company recorded a 36% hike in the turnover of its UK and Irish business between 2012 and the end of 2013, hitting a total income of £5.27 billion (€6.75 billion) for the year – a new record for the retailer. Its after-tax profits were up a massive 76% to £198 million (€253 million) for the same period. Aldi reported that it had attracted 1,000,000 more shoppers to its stores in August last year than during the same month in 2012. The company said the growth came despite the large supermarkets “actively targeting Aldi” and it had boosted its UK market share from 3.1% at the start of 2013 to its current level of 4.8%. In Ireland, the company has been even more successful at taking business from the big three supermarket chains – Tesco, SuperValu and Dunnes – with its share of total customer spending now at 8.4%, according to the latest survey. Together Aldi and Lidl, which has a slightly bigger slice of the Irish market than its German rival, have lifted their stake of the local supermarket business from 15% to 17% in just a year. The company said its growth in the first half of this year had been even stronger than in the first six months of 2013. Meanwhile, the latest supermarket advertising analysis has shown both Aldi and Lidl went on a media offensive this year as all the major chains upped their advertising in the competitive market. The German pair accounted for nearly half of all advertising money flowing from the grocery trade, according to Nielsen research carried out for Checkout magazine. 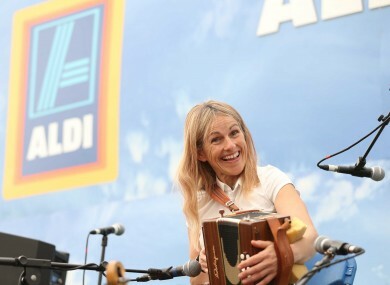 Aldi nearly doubled its advertising outlay in the second quarter of this year when compared to the same period last year, although Lidl still had the biggest budget of any grocery retailer. Tesco had the second-biggest boost, increasing its advertising spend nearly 60% over the period. Of the major players, Dunnes Stores relied the least on advertising, accounting for less than 10% of the total spent within the grocery market. Checkout editor Stephen Wynne-Jones said the German chains’ market share was still considerably lower than their competitors but both “shout louder” than the rest of the industry when it came to marketing. He said the discounters were looking to both win the price battle and install strong “quality associations” among customers. Supermarkets remain among the biggest spenders on advertising and all the major chains except Dunnes were in the top 10 advertisers across all industries. READ: Why did farmers bring a Grim Reaper to an Aldi store? Email “Aldi scores massive sales boost as supermarkets declare all-out ad war”. Feedback on “Aldi scores massive sales boost as supermarkets declare all-out ad war”.